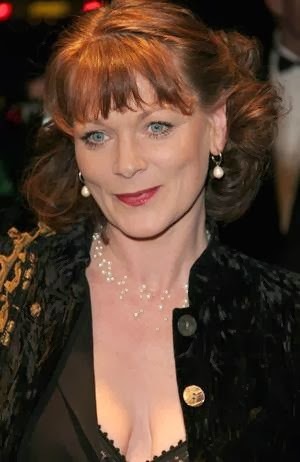 The fabulous Samantha Bond (Lady Rosamund in Downton Abbey and Miss Moneypenny in the James Bond Films) is to appear in the musical Dirty Rotten Scoundrels directed by the inimitable Jerry Mitchell at the Savoy Theatre. This is her first West End musical co-starring alongside Robert Lindsay, Rufus Hound, Katherine Kingsley and John Marquez. She is playing Muriel who is a wealthy American divorcee living on the French Riviera who comes into contact with the team of con artists. It also means that she will be working just down the road fro her husband Alexander Hanson who is playing Stephen Ward in Andrew Lloyd Webber's musical of the same name. Aside from playing Lady Rosamund on Downton Abbey, and starring as Miss Moneypenny in a number of James Bond films. She has also appeared on television in Outnumbered, Midsomer Murders, The Queen, The Sarah Jane Adventures, Distant Shores, Hotel Babylon, Fanny Hill, Donovan, Brand Spanking New Show, The Bill and Mansfield Park. Her stage credits include Amy's View on Broadway and Arcadia, An Ideal Husband and What the Butler Saw in the West End. Dirty Rotten Scoundrels starts previews at the Savoy on 10th March 2014, opens on 3rd April and is booking until 29th November 201 prior to a pre-West End run in Manchester and Aylesbury.